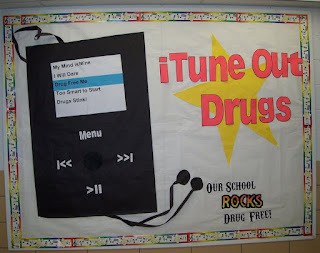 iTune Out Drugs - - - Hurray for Red Ribbon Week! 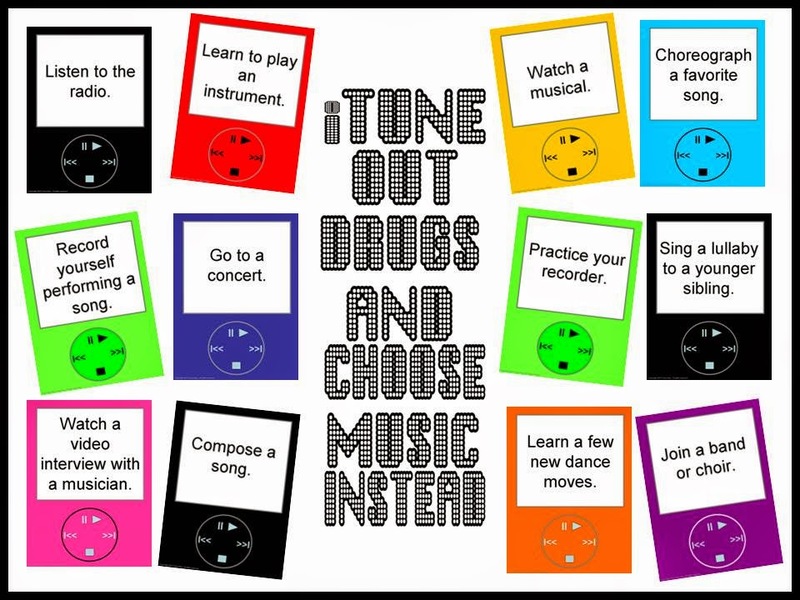 I just LOVE this year's Red Ribbon Week theme: iTune Out Drugs, Our School ROCKS Drug Free! In preparing for this fun week (which features days like "Heavy Metal Hair Day") we are decorating the school. There are guitars hung in the hall ways and musical banners hanging for everyone to see. I have a couple of bulletin boards up. This board is in the main hallway and displays a HUGE iPod. The songs on the playlist are "My Mind is Mine", "I Will Dare", "Drug Free Me", "Too Smart to Start" and "Drugs Stink". Follow the links on these songs to purchase a copy for your iPod or MP3 player at home. I know. I just love things that are punny! 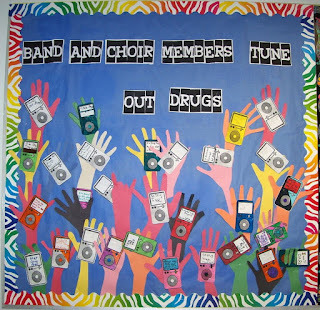 This clever wall display runs down the hallway by the music room. 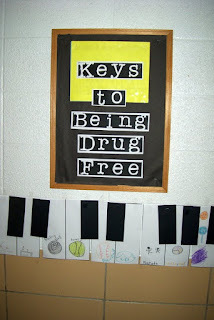 on the keys students have illustrated activities they can do instead of doing drugs. Band and Choir members created their own display for Red Ribbon Week. 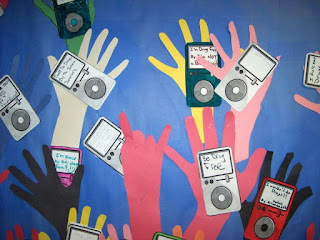 Their iPods contain drug free messages and they are held by hands that students traced and cut out. 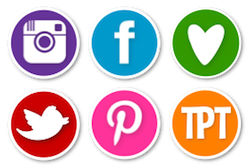 Here's a bulletin board that you can download, print and post. Steady beat is a skill that we work on at all grade levels. A fun activity that we do in third grade is called "Beat Leaders". Students work in groups of 4 or 5 and practice different ways to show steady beat. Clapping, patting, nodding, stomping, etc... are some basic ways to do this. 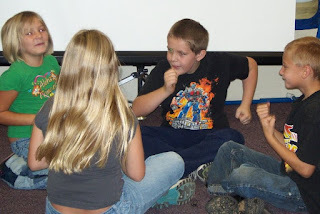 These clever third graders used moves like flapping, poking and air punches to show the beat! 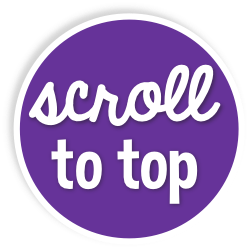 This activity can be done anywhere. Just turn on some music. I like to piece instrumental pieces so that the words don't distract from find the beat. Using a staff and a hand full of bottlecaps, students in Fourth Grade practiced reading pitches on the treble clef staff. This skill will be quite valuable when they start recorders in the spring. Working with partners, students created words with the musical alphabet (A B C D E F and G) and then their partner had to use the bottle caps to "spell" the word on the staff. Students plotted words like baggage, cafe, add, Gabe, bag and more. Pumpkins make the Prettiest Music! I know that fall has come. and keep you for a while! Coming Soon: First Graders perform this poem as a scale song. Third and Fourth graders are great rhythm readers and even better rhythm song writers! 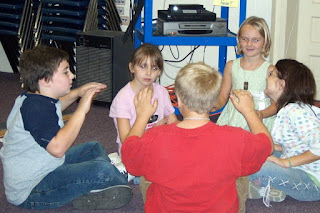 In this activity students used their knowledge of note values to create rhythm patterns using body percussion. We used stomping, patsching, clapping and snapping in our songs. Instead of using the traditional five lined staff, we used a four line staff. Each line represented one of the following: stomp, pat, clap or snap. Students then notated which body percussion element to use by writing the note on its line. Students created some fabulous songs! In the pictures above, students work with partners to create patterns and them perform them.